If you guessed that mine was the third row down, directly to the right of the text, you were correct! You might have spied Veranda! I made this block roughly the same time I made Bejeweled. I had yo-yos on my mind. Its called "All Buttoned Up" and I think it would also work well in black and white - like a little tuxedo! I originally pictured this block running vertically down a lap-sized quilt. Wouldn't it be cute in a kid's room? I like it "sans borders". It really isn't complex to make, and the yo-yos make it perfect to take on a trip. Now for the giveaway! I have 2 Quiltmaker 100 Block Volume 6 magazines to give away, and each winner will get to choose three patterns of their choice from my pattern line! All you need to do is leave me a comment (just one) on this post telling me what size quilt is your favorite to make. And your favorite to buy patterns for if they are two different things. (There are those of us who are famous for biting off more than we can chew when we are looking at patterns and books or even fabric... ahem.) Do you like making lap-quilts, wall hangings, twin sized quilts, etc.? Please consider becoming a follower if you aren't already and you must leave me a way to contact you should you win. Deadline is this Friday (the 4th) at midnight. For more chances to win please visit the other block designers who are participating in the giveaways today, as well as Quiltly Pleasures, Quiltmaker's blog. I really like making lap sized quilts. They're perfect for napping on the couch! 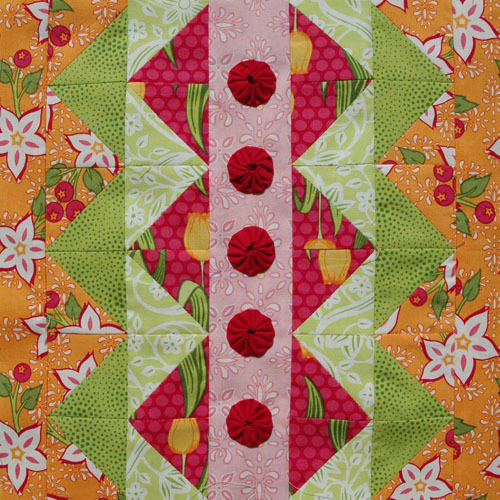 Wow that is a gorgeous block, and I love the whole quilt made from it! I generally make quilts around 80" x 100", but it is not usual to find patterns in this size so most patterns I buy are smaller. I tend to make a lot of wall hangings as gifts. I have made quilts for all of our beds and have started making a second one for each. Now up to son #3's next quilt. Lap size is generally large enough for me. Thanks for the giveaway. I love to make lap size quilts, they're so much fun to make. Your block's stunning, congrats!!!! My favourite size is just big enough to snuggle on the couch with my husband or a couple of kids! About 50 inches by 70 inches or so. PERFECT! Usually make a twin or larger quilt. This way anybody can use them for any size beds. I'm going to say lap quilt as the best size for me. Thanks for the chance! I tend to like the lap quilt size and I am one of your new followers, thanks. I lovel to make lap sized quilts. But mostly I do wallquilts at the moment. I love your block. Looks so special! Hi Amanda: Congrats on you block being on the cover! My favorite size of quilts are "bed" size for the bed of who ever is getting the quilt. I have only made one quilt so far, and it was a double! at the moment it's minis between 12 and 18 inches - I can experiment without having to use up large amounts of fabric. Else everything big you can comfortably snuggle under. I like to make quilts that are lap or single-bed topper size. That way I can do everything including the quilting myself. Love yo-yos so thank you for bringing them into this century, so love the block with the colours too. Is there such a quilt-size as twinlap or laptwin???? Thanks for the giveaway Covergirl. You are my only visit today...darn homework lol. I love lap quilts and baby quilts and make a lot of them for gifts. When buying patterns I don't usually worry about the size as I often just convert it for my needs. i love making twin sized quilts! Oh yeah, I also haven't purchased any quilt patterns but drool over many. I find that I ma still more attracted to lap size or twin sized layouts. I love making baby and lap size quilts, simply because they're easier to wrestle through my machine! Love your block! I started off thinking there was no point in making anything but bed size. Now, after realizing the time & work envolved, I see the value of smaller sizes as well! Your block is super cute & I love that you added the yo-yos! Lap quilts & pillow covers are my favorite projects. Thanks for the chance to win! The biggest I do is a lap quilt only because that's the biggest I can manage to quilt in my machine at the moment. Thanks for the giveaway. I am working on making quilts for all the beds, so I guess I would say my favorite size is twin size, since that's what we have the most of, and they sure go quicker than queen. Thanks for the chance to win! I guess wall hangings are my favorite because I love to design them, then finish them quickly. In reality, I probalby make more lap quilts for charity quilts. Of course, those are very rewarding. Thanks so much for the giveaway! Oh, and I'm a follower and love, love, love your patterns! I almost always make queen-sized quilts, and I hand quilt them. Crzy, I know. Congrats on making the cover with your beautiful block. I usually buy patterns to make at least a twin size or larger quilt. When sitting on the couch, I like at least two people to snuggle under my quilts. I like lap size and twin. Love your block! I usually make queen size quilts. They seem to work for just about everything and everyone. Great block! I love to make big quilts.... which is why I don't make them very often. I would say queen is my preferred although I have mad a lot more lap :) Thanks! And congrats. I like to make lap quilts as I'm running out of beds for bigger ones!!! I love making any size quilt, however, I tend to create large quilts more often. I've never bought a quilt pattern before...I usually go with what is in my head and create from there. I absolutely love your block - I agree, black and white with different color "buttons" on each "tuxedo" would be stunning! I adore making large bed-size quilts, but lately I've been making smaller projects so that I can practice my quilting! Thanks for the chance to win! I like the lap size quilts. Great for snuggling. I also can't resist mini-quilts. So cute. I follow you. fingers crossed like mad- I'd love a copy! I love making lap quilts that are around 45 by 60 as that is the largest size I can easily quilt on my machine. As for patterns, I don't usually buy them because I like designing my own. Although sometimes I use blocks from books (LIke the Quiltmaker's 100) as part of the design. So I would love to win a copy of this magazine. I should make lap sized quilts or smaller but normally the size I make is twin sized or bigger. My current project is a 72" x 76" quilt. The one I just finished is 54" x 68". 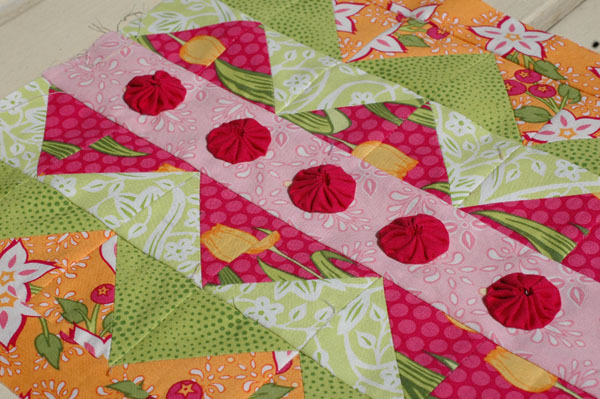 Love the block - I love lap sized quilts and baby quilts. I can see this done in batiks for my mom who is in a nursing home. Jewel tones for her. What a cute block! I like making lap quilts, but I prefer patterns that have various sizes. Otherwise, I prefer twin size patterns. Thanks for the giveaway! My favorite size is wall hangings about 48" square. But I make quite a few bed quilts as they are more practical. 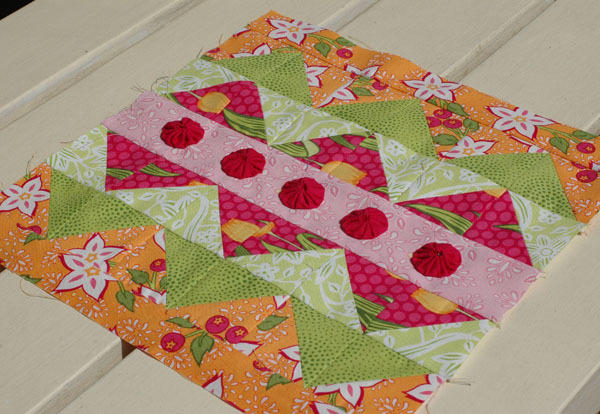 I Love your Veranda Quilt Block! I also Love your Fabrics! I Love making Lap Quilts...I would Love to have your "Under the Veranda" Patterns! 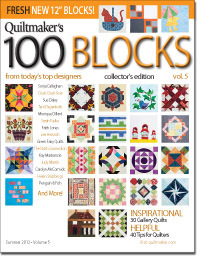 Thanks for having this Great Giveaway of Quiltmaker's 100 Blocks Volume 5. Your block is very, very nice. I really like to make wall hangings, although I make all size quilts. With wall hangings, I can use more applique and it's a quicker gratification! I like to make all sizes, but currently have been doing some miniatures. Love the tecture of this block - thinking a must do for my grandaughter. I seem to favor lap size and baby size quilts. They are quick to put together and fun to cuddle under. I make full sized, perfect for sleeping under. I love to sew for babies so I usually make baby quilts. Congratulations and thanks for the giveaway. I definitely prefer wall size quilts. I like to display them and they are quick to complete. Your block is a real cutie. I am stuck on yo-yo's right now, too,so it grabbed my eye. Lap quilt size is my favourite...but I am really liking the Schnibble sized quilts as they are so quick and fast and look great on a table. Thanks for the chance to win a magazine and patterns!! You did a wonderful job!! My favorite is a lap quilt. I love your block that is on the cover. I love having hand work to do in the evenings so this would be a great quilt to work on for me. I love yo-yos and have a queen size quilt made with all yo-yos. Lap quilts is my favorite. This is a nice block to make and I think I will give it a try. I like making bed size quilts because we use them the most. But I am planning a few wall hangings for my sewing room. I like making lap or twin sized quilts. This block is way too cute. Thank you for showcasing a possible design in a quilt -- it looks wonderful! Cute block! I usually make quilts that consist of about 30 blocks - that's about as many as I can make before it threatens to become a UFO. So depending on the block size that can be about 50 x 60 before a border, so lap-sized? I'm trying to make more wall-hangings so that I feel that sense of accomplishment earlier than usual. Very few of my quilts end up on beds anyway so I guess it doesn't matter what size I make them! I make everything from miniatures ( 8"x8" ) to kings (110"x110"). 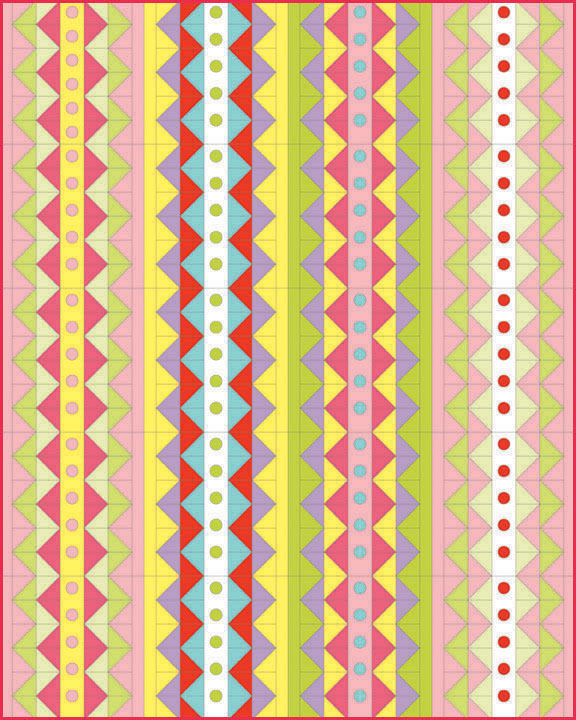 If I like a pattern that's not the right size, I'll reduce it or enlarge it depending on the project. Love the use of the yo's yo's! Congrats! Lap quilts for me! They seem the most useful. And my kids love them for making forts. My favorite quilts to make are crib size. They are quick to make and an easy size to quilt. As far as patterns, sizes isn't so important if I like the pattern. I can always ajust the size by the number of blocks I make. Yea, guessed correctly! As I beginner quilter, I have only attempted to make doll, baby, and lap size quilts. I would like to venture out and make bed-size quilts, depending on the recipients' bed as I gain confidence. Thanks for the opportunity to win this! I like making twin quilts - perfect size for my daughter, and not too much trouble to quilt on my regular old sewing machine. But I don't have much control when it comes to patterns, so I can't say I have a favorite size there! About 60" square is the largest I want to deal with anymore. Seems like I never get the large ones done because life too often interferes. lap size. I like to see progress and anything bigger loses my attention. I love to gift lap size quilt.Your block is very beautiful! I like making and buying patterns for a twin sized or larger. Although the quilting part can be a bit of a challenge. I have made a queen size but prefer the smaller ones as I have done several donation child size as I am learning to machine quilt on my Singer. I love making doll quilts. A lot of my quilts grow as they go, so are between double and queen. but lately I am trying to make bed siz quilt ( king size )sew far I have made 4 king size quilts. Patterns seam to be double to queen size and with some applique. thanks for hosting a give away and I wanted to let you know that that is a cute block you came up with too. I feel most comfortable making twin or "picnic" sized quilts :o) So patterns that look good on a smaller scale are my favorite. The block looks great - and it's lovely to see it on the cover! Most of the quilts I seen to have finished are single bed or smaller...all my ufo's are queen sized! my favorite size quilt to make is lap top. crib sized is my favorite.. especially since when I am making that size I have a special baby in mind.. the yo-yo's would make a great texture for a quilt to put on the floor for baby to play on.. love this.. I have lots of ideas.. I like making lap or throw sizes, the most. Practical and easier to finish. A wonderful block to use for a teen or young adult. I make mostly baby or lap size quilts, I like to do the quilting myself and I can handle this size without hating the quilt when I'm done :). Thanks. I like making 40x40 quilts to give away. That size i can actually quilt on my regular sewing machine. I think your block is adorable. Would make an great little girl quilt. I like to a quilts about 55 wide by 75 long. That has become the lap size my family loves. Lap size quilts are my favorites. They are perfect for both use as a lap quilt and for my younger grandkids to use when they visit us. And I love "yoyos"! I have made several hundred, along with my granddaughters, in the last 2 years. I tend to make twin size quilts:) Congratulations on having your block in Vol. 5! Queen sized quilts - and I rarely buy separate patterns. Really like the yo-yos and that zig zag layout you posted. Congratulations on your block being selected for QM 100 Blocks. I'm already a follower (from before you became so famous). I enjoy making wall hangings the most, also buying patterns for them. They are usually pretty quick compared to a bed quilt and usually funny or seasonal! Congratulations on being included in 100 Blocks!! Lap quilts are my favorites to make - I think you need to be able to nap under a quilt to make it worthwhile :-) Thanks for the chance to win! I love the quilt picture you show with the blocks forming vertical lines. So cute! My favorite size quilt to make is a lap-quilt. I love making lap size quilts & enjoy buying patterns to make them. I am a follower of yours and thank you for the giveaway! Your patterns are so pretty, love them! While enjoy the speed of smaller lap size quits, I prefer to make bed size quits, usually double or queen. I enjoy the process as much as the finish and feel like I'm leaving a friend when the quilt is finally bound. I like your upbeat fun patterns. Congrats on making the cover! Love your block - it'll make a really cute quilt for my nephew ;-) Thanks "sew much" for this chance to win! I like making twin sized, most versatile, but need to be making wheelchair lap quilts!! I like making twin size quilts and lap size the best. Great blog! Congratulations! Congrats on your cover block! I like to make throw/lap size quilts most - I can get them DONE!! I guess my favorite size to make is lap --- though much depends on who will be receiving the quilt and whether it is for a bed or decor. I enjoy making yo yos, so it's fun to see a different way to use them. I just love this block Amanda with the little yo-yo's added like that. Very pretty. My favorite for now is to make lap or baby quilts. I'm sure once I am more experienced I'll try a larger quilt but for now the smaller ones are easier to handle. Congratulations on being included in this next 100 Blocks Magazine, Issue 5. I like making quilt in 2 different sizes. Oversized queen usually have to expand the designs. OR Lap quilts we live in the basement of a house so they come in handy during the winter. I really prefer sizes less than 45x45 : runners, lap quilts, "bed quilts" to keep my feet warm and to protect my bed quilt from excessive cat fur. They work up quick! Love the block. At first I thought the yo-yos were buttons! cute block!! I make queen-size, crib-size most of the time. I purchase patterns that I like and then alter them to the size I want. I think most of my quilts would be considered long lap size, but I have made a to cover my queen size bed, and yes, it was a challenge to finish. I like to make table covers and runners because I can use them often. My favorite size to make is lap-sized. Since I'm tall I tend to make quilts at least 6' tall (even ones for other people), the width varies. My latest project was a pillow for a swap - it was so fast and easy compared to my quilts - just 2 large wonky log cabin quilt blocks. The hardest part was the zipper - I'd gotten out of practice as I don't sew many clothes these days! I tend to make large lap size quilts. The males in our family are all over 6 feet tall, so my lap quilts are usually the size for twin beds. I like to make throw-sized quilts best, especially when I machine quilt them myself. I end up making more bed quilts because they are the most useful, and I just wrestle them into the machine! I also like to make baby quilts, they are fast and fun. I do love patterns that give options in sizes, so I can decide how the design works with my fabrics and what I need to make. I make any size from runner up to large queen (almost king, yikes, not excited about quilting that on my domestic! Your block is really cute! Lately I have been into lap size quilts as they are fun and quicker to make than a full size quilt. I am a follower ,thanks for the chance to win and congratulations on your sweet block. I like making Queen size quilts, but don't like quilting the layers together on my domestic. That is why I'm buying a Longarm! I like to make lap quilts and baby quilts. People seem to love getting those. My baby quilts are smaller than most - at most 36 inches square. Moms like them because they can use them in car seat and strollers without overwhelming the baby, as quick rugs when baby has to play on the floor and as a changing mat in emergencies. I like them cuz their fast. Love it!! I can see this block twisted and turned for some unique design. Very Clever. Your block is so great. I mostly make smaller quilts. I have made all the bigs one I need for beds so now I am into making smaller ones. I really like to make wall hanging sized quilts, though my family and I are all running out of wall space! WOW, I need to make queen-size quilts for each of my six children, but I've been filling in between with lap-size Christmas quilts, one for each of my four sisters. None will be alike, but for the sisters I'm using fabric with cardinals in memory of our mother who loved those red birds! If I am not in a big hurry to complete a project, I prefer queen size quilts. People can still use them as lap quilts if they like but they can be used on their beds also. Lap quilts are my favorite size. That way I know I can quilt them myself on my DSM. Much larger than that and they are too much work. If I am not in a hurry I prefer to do a queen size quilt. Then people can use it as a lap quilt or a quilt for their bed if they choose. I love your square. This would be fun to do in defferent kids material for my grandsons rooms. I just love your block! congrats!!! Oh I buy patterns and lots of fabric. I am sitting next to a box of patterns and piles of fabric. I like to be able to make what I want when I want. What an awesome block - I think it would make an adorable baby quilt! That said, my favorite size quilt is either lap size or wall hanging as I have a short attention span and just a domestic machine for quilting. I am always biting off more than I can chew. I guess I have made more throw size than anything else, but I am always adding another row of blocks here and there to make the quilt bigger and bigger and bigger. Then I can't umderstand how hard it is to quilt on my DSM. LOL! My favorite is lap sized or baby sized quilts because they are obviously smaller. I have to tell you I LOVE Veranda with a vengeance - it is just gorgeous. I really enjoy using the quilts that I make, or having loved ones actually use them, so I like making King Size quilts, but for fun quick projects, I like lap quilt patterns. I stay within the guidelines for Quilts of Valor, my favorite charity. Usually about 60x70 (twin?) is perfect. Ha! you know me so well! I make lap quilts mostly, but start out buying queen size patterns! I love you garden paths, garden jewels, and blossoms patterns! 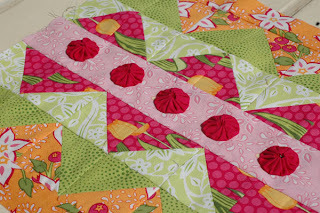 Oh, I saw this block featured on one of the sponsor sites, and I loved it then and still do! I never thought of it in black and white...how cute would that be! I mostly enjoy making lap sized quilts. Just enough blocks to make it satisfying with out getting sick of them. Just the right size to machine quilt. I've been making alot of Schnibble quilts lately, but I really like to make full size quilts, too. Your block is beautiful and I agree it would be great in black and white. I am new to quilting so have only made lap size so far but would like to tackle a bigger one. I actually have lots of books with patterns for all quilt sizes that I bought over the years because I knew some day I wanted to learn to quilt. I love making lap and baby quilts! Twin sized are cool too! thanks for the great giveaway and congrats on a wonderful block - it would be very nice done in black and white! My favourite would be lap-sized quilts. I like twin sized quilts the most. Thanks for the chance at your giveaway. I have made each of the children a keepsake quilt and baby quilts for each grandchild that comes along and as they grow to a big kid bed. I like to make lap quilts now - not to big and challenge myself with each new project. Well I really love to make lap quilts, but when I just feel like making something faster I have made lots of table toppers and wall hanging. Thanks for the chance to win. I love to make wall hangings but it is easy to try new ideas and colors. In quilts I generally do lap size. Your block has lots of fun possibilities. I like making big couch-cuddler quilts, ones that are long enough that feet don't stick out when someone is stretched out with a book, watching tv, or napping. Lap top is my favorite size. I like to do lap quilts most. Sometimes will do twin size to use as lap quilts for the tall guys. I love making queen size or larger. Thanks for the giveaway. I would say my favorite to make is lap size. That may change to baby size if I ever have grandchildren! When I buy a pattern, I don't choose it by size, but by how much I like the pattern. Many patterns can be re-sized if needed or desired. By the way, I love your block. It may just be my favorite so far. I can envision it in so many fabric colors and patterns. My favorites to make are lap sized quilts, mainly because I don't have to struggle to quilt them on my machine and because I am into instant (well, nearly) gratification. I like to make lap size the best: my daughters like to chose their own style for their comforters, and since they often watch TV on my bed I don't want my quilt to get mucked up by them being on it, so a lap quilt can be folded at the foot of my bed and then pulled over me for a nap, or pulled up on an especially cold night. I'm also getting into making baby quilts for the many great-neices and nephews that are being born. It's nice to have something that finishes up fairly quickly!! Love your block!! And LOVE the veranda fabric!! I like making big quilts, but it's a necessity since my son is 6' 5". I also like doing baby & kid quilts to give away. I LOVE your block! I think most of the quilts I've made have been roughly queen-sized, but I enjoy making lap size the most...it's quicker, cheaper on supplies, and doesn't throw my back out to wrestle under the needle while fmq-ing. I find lap quilts to be a bit too small for most in my family. So, I tend to make either twin (and use it as a lap quilt) or double. I drool over queen/king size but hesitate to make the jump to actually doing one! I love the block. Congrats on being chosen for a block. I love making twin and full quilts. I love to see them used on beds. I mostly make baby/wall hanging size quilts. I love your block and have been reading your blog for ages. I generally make bed sized quilts. Maybe Id get more done if I did lap sizes but 99% of the time its a queen or larger. by the way i adore the Easter Table Topper!! I prefer lap lap sized quilts and baby quilts. But I am starting to strip piece the beginning of a queen-size quilt. Thanks for the chance to win. My favorites are Queen sized quilts. I don't worry about what size pattern I buy as I can alter it to whatever I need. Love your block! Looks awesome in your fabric. I don't need the magazine, but I couldn't pass up commenting for a chance to win your patterns! I prefer making larger quilts varying between large lap to queen size. Thanks for the chance to win the next volume so I can add it to my collection of the others. I had already spied your block and decided I had to make it into a quilt or tablerunner! Love it! My favorite size quilt is a twin sized because it is small enough to cuddle up with and large enough to put on a full or queen size bed, too! Can't wait to get my hands on Volume 5! I have the other 4 issues and refer to them ALL the time! Just liked you on FB and followed and subscribed to your e-mails! Congratulations on your great block! i usually make bed quilts, although lately, lap quilts are becoming a favourite. I dont really have a favorite size quilt -- it depends on my mood. Most of what I have done are full size to queen though. My favorite size quilt to make is wall hanging, they go fast. I do buy patterns for bed quilts and lap quilts also. I usually make throw size quilts, but these are almost as large as twin size. The patterns I buy are usually crib size or throw size, and I simply adapt the pattern to the size I want. Love your block, love all your patterns, and would be thrilled to win! I like twin sized quilts. Everyone can use that size. Love to make queen size quilts, or little wallhangings, just to see if it's worth making bigger. I "like" making baby quilts the most, but I enjoy bed quilts more, so those are the size I make the most. I tend to make baby quilts or throw-sized quilts! I'd like to eventually make a king-sized quilt for my bed, though. 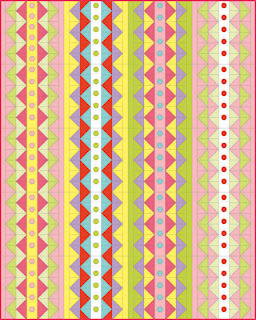 I like to use Mary's strippy quilt (Maryquilts.com)as there are so many choices of fun fabrics to make this. My favorite size quilts to make are either wall hangings or table toppers...this way I get to try out new designs and can do the quilting myself. Thanks for the chance! I like big huge snuggly quilts but quilting them is a pain on a home machine and I don't want to spend money on sending them to a quilter when I could buy more fabric so mostly I don't finish anything. I am determined to finish a few with these couple weeks I have off from school between spring and summer semesters though. I actually did guess right! Woot! I like lap sized best, mostly because I still despise the basting part and don't want to make it worse LOL! I like to make full-size quilts. And I usually chose something that will challenge me and then wonder why it takes me so long to finish it. My favourite size quilt to make is definitely baby quilts. I've made several for my grandbabies but I make them about 45"x58" so they're large enough to still use and/or play with as they get a little older. My favorite to make is anything i can fit into my machine to quilt. LOL.. usually i can manage a twin, or less... I dont dare do bigger because i just dont see it fitting into the throat of my machine! Cute block, love the yo yos, my favorite size quilt to make is lap, mind you most of the lap quilts I make are around 80 inches square. Your block is delightful with the yo-yos. I usually make more wallhangings than anything else these days as I live full-time in an RV. I love your Easter Table Topper also and I'll be downloading the pdf for next year. it's so beautiful and reminds me of deviled egg plates.